Summer has returned to the Lake District, and to make the most of it I was over near Loweswater to summit a few new fells. Considering the amount of people around, the fells were fairly quiet with just a couple of people seen along the way. I originally planned to start the walk from Maggie's Bridge but arriving to a full car park I was forced to turn back and drive just over a mile back where I came from to get a parking space. This photo, looking up to Low Fell was taken just as I crossed the River Cocker. Now heading down to Maggie's Bridge with a lovely view of Carling Knott and the slopes of Burnbank Fell (the first Wainwright of the day) and a tiny speck of Loweswater. Darling Fell and Low Fell. The first part of the walk took me around High Nook and along a superb terrace. This photo shows Highnook Beck and Blake Fell. A view back down the Vale of Lorton from the same location. Black Crag and Highnook Tarn (not named on the OS Map). A close up of Highnook Tarn. The path just above Holme Wood leading down to the terrace path. And the stunning view from the terrace path. One path not to be missed! A view to the coast from the terrace path. If it were clearer you'd be able to see Scotland to the right. Now ascending the steep diagonal path up Burnbank Fell with the view to the coast opening up even more. Loweswater and the Fellbarrow group of fells. The summit of Burnbank Fell showing the path I then took to head onto Blake Fell. The summit cairn on Burnbank Fell and a fellow walker. 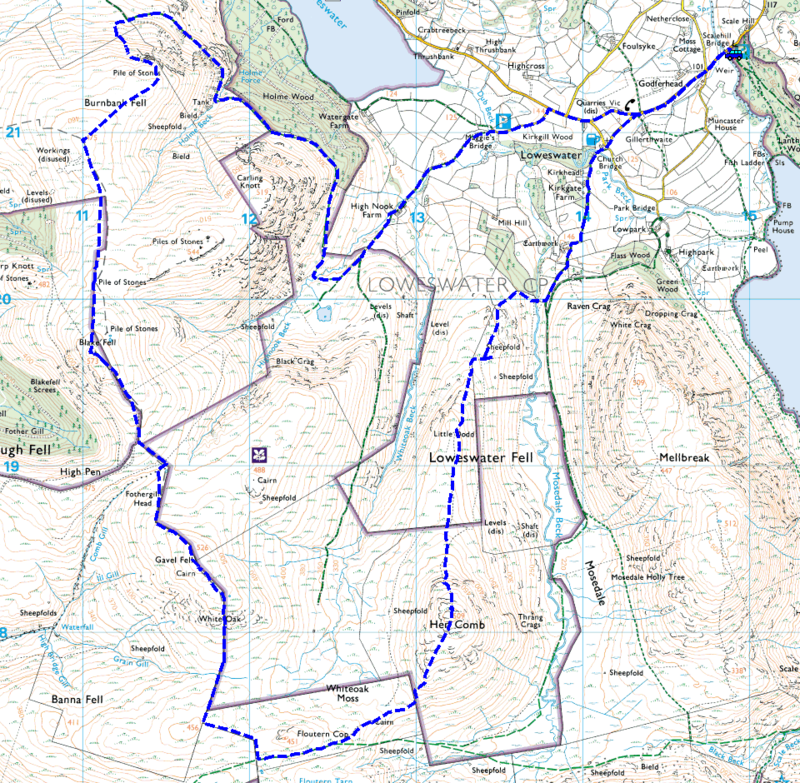 Time to follow the fence again towards Gavel Fell. Gavel Fell summit cairn with a great view to Grasmoor. From here I followed the fence again to join the footpath near Floutern Tarn. Floutern Tarn below Floutern Crag. Looking down a secluded Mosedale towards Robinson - Red Pike to the far right. The ancient cairn near Whiteoak Moss and Hen Comb behind. From here it was a simple but steep walk to the top of Hen Comb. The summit cairn on Hen Comb with Mellbreak and the Grasmoor fells behind. Time for a stop for lunch, about time really seeing as I just walked 13.6km to get here - and what a view to go with it! Mosedale and the lonely Mosedale Holly Tree. The ancient earthworks next to the path leading back into Loweswater. Does anyone know what used to be here? The craggy and very steep north side of Mellbreak. Crummock Water and the slopes of Rannerdale Knotts, with Haystacks and Great Gable behind.